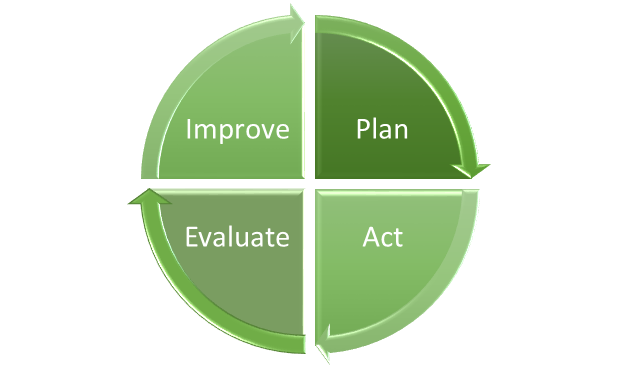 The approach to Quality Management at UNE is based on a commitment to continuous improvement enacted through the four-stage quality cycle of Plan, Act, Evaluate, Improve. Plan: denotes formal planning at all levels including university level strategic planning, and planning by organisational units. Act: includes all the intentional activities that are undertaken to meet objectives, implement plans and produce outcomes. Evaluate: incorporates two aspects: monitoring and review. Monitoring is a short and medium term activity mainly for management, formative and developmental purposes. Review is a longer term and more formal process that has both formative and summative purposes. Improve: identifies the process by which the results of evaluation, both monitoring and review, are fed back in order to generate improvement. This may cause modification to an existing plan or development of a new plan, and thus the cycle commences once more. School reviews are conducted to ensure that schools are functioning effectively, have the resources needed to implement the strategy of the University, and is delivering quality outcomes in teaching and learning, research, community engagement, and student and staff performance. A course review evaluates the academic program of an award, including the course structure, learning outcomes, graduate attributes, assessment, quality of teaching and learning, external benchmarking, threshold standards, student feedback, accrediting and professional feedback. Unit Monitoring is a key component of Academic Quality at UNE, allowing the monitoring, evaluation, review of units of study delivered, based on mode of delivery, using agreed performance indicators. Unit Monitoring provides the opportunity to address any identified deficiencies of a unit mode through the development of action plans, and the subsequent improvement of units, as well as to recognize unit modes with high levels of student satisfaction. Unit Reviews allow the evaluation and peer review of content and learning outcomes of a unit, relevancy for the course/s it relates to, pedagogy and assessment, assessment, and benchmarking of the assessment and curriculum to external units. Accreditation requirements and legislative requirements may cause a unit to be reviewed outside of its normal review cycle. Monitoring student progress and success allows UNE to evaluate and review that all students, regardless of their background or mode of study, are given the best chance to succeed at UNE. This analysis allows UNE to evaluate student group performance in areas of grade point average, pass rates, retention, and completion, and interpret findings to devise improvement strategies. The resulting analysis allows UNE to inform and improve activity across key academic and business functions, including admission criteria, advanced standing, teaching, delivery and support strategies. A Unit Mode refers to the internal or external offering of a particular unit, e.g. UNIT123 internal and UNIT123 external count as 2 unit modes. While Unit Monitoring attempts to monitor all unit modes every time they are taught, there are sets of unit modes that are excluded from the Unit Monitoring Process, such as research units and honours units. Unit modes are identified as having low enrolment numbers when they have less than or equal to 5 students enrolled at the census date. Unit evaluation data is only reported at the unit mode level when survey data is provided by 5 or more respondents, hence, these unit modes do not record an overall satisfaction value in the period. A student undertaking full-time study for a year generates 1.0 EFTSL. Unit modes become eligible for a commendation when both the overall satisfaction value (OS) and the attrition rate are above benchmark quality standards. In addition, unit modes with smaller class sizes are required to achieve relatively higher satisfaction levels. Internal unit modes are also required to achieve lower attrition rates than external unit modes. Attrition rate <= 12% (for external mode). Attrition rate >= 20% (for external mode). Unit modes that are triggered on low overall satisfaction values of 3.0 or less but with attrition values below those described above are flagged as recommended for improvement through the unit monitoring process, and a recommended action plan is triggered. Action plans should be developed by the Unit Coordinator in conjunction with the Head of School. Completed Action Plans should be submitted to the Director, Academic Quality for approval, with notification to the Provost & Deputy Vice-Chancellor. Student unit evaluations are routinely administered toward the end of a teaching period to each student enrolled in a unit mode at the trimester census date. This excludes units based on research, special or advanced topics, dissertations or theses, field studies, and work placements or practical experience. Overall Satisfaction is one of the measures considered when determining whether a unit is eligible for a commendation or should produce an improvement action plan. Unit modes without reported overall satisfaction values are unable to be eligible for commendations and cannot be assessed as requiring (or being recommended for) an action plan for improvement. A threshold result of 3.0 or less on the Overall Satisfaction scale is considered a relatively low result and a score of 4.0 or greater (depending on class size) is considered relatively high. The Unit Mode Survey Response Rate is the number of unit evaluation survey responses received as a proportion of the number of unit mode student enrolments at the census date. The response rate is an important metric that strongly influences the statistical validity of the unit evaluation survey results overall, and for individual unit modes. The Unit Mode Pass Rate is the number of unit mode enrolments with a Pass result, or better, expressed as a percentage of the total number of completed unit mode enrolments which have a valid result outcome. The Unit Mode Grade Point Average (GPA) is a numerical score that summarises academic performance in a course over the duration of the enrolment in the course, expressed as a mean. A GPA score of 4 equates to a ‘Pass’ result, while a GPA of 5 equates to a ‘Credit’ and so on. The Unit Mode Grade Distribution is derived by a count of the number of results at each of the six grade points expressed as a percentage of the total number of results for the unit mode. Unit Mode Attrition is the percentage of students who have withdrawn from the unit mode between the end of the first day of the second week of teaching and the trimester census date. A unit mode is flagged as having high attrition when the attrition rate of greater than or equal to 20% is reached. Unit Mode Attrition is one of the measures used to determine whether a unit mode is eligible for commendation or flagged for an action plan for improvement. The University recognises the importance of retaining students and aims to minimise the rate of unit attrition.